To reuse water requires capital that they would rather not spend if it's cheaper for them just to dispose of it. I think that's why we don't reuse that much. It might be more cost effective to figure out a way to reuse it than it would be not to. Water conservation expert Daniel L. Theobald (email wastewaterdan@yahoo.com) of Greenville, S.C., has worked as a trainer and consultant in the water and wastewater industry for 15 years. As the "Wastewater Wizard" prepared to join thousands of other water industry professionals at the WEFTEC 2012 conference in New Orleans, he spoke Sept. 26 with EP Editorial Director Jerry Laws about water and wastewater issues and industry developments. EP: As you head to the WEFTEC show, what are you planning to do there? Daniel Theobald: What I am planning on doing is taking some documentation around about my water conservation and sharing it with the people that have booths and that are just generally at the show. I’ll be talking to anyone and everyone about water conservation and what can be done by industry and non-industry folks. I went in 2001, and at that time I was talking with people about the start-up of my website and cost reduction. At that point I was just documenting it, and my brother was working with me on maintenance stuff. I didn’t have specifics like I have now. I’ve got three hundred contacts, so hopefully I’ll get more with this particular event, because I think I have more to share with everyone. EP: You said 2001; have you been working on water issues for even longer than that? DT: October one of this year will be start of year 26. I started October 1, 1987, as a valve-turning waste operator and started training on wastewater through the technical colleges in September of 1989. That is when I started my business part time, but I stayed as a full-time operator for ten years, until 1997. That’s when I started working for myself, and then it was in consulting and training. In 2001 I set up my website and started executing cost reductions. Most of that stuff on results and so forth is actually on my main wastewater wizard page on LinkedIn. EP: Do you work in the U.S. only or around the world? DT: Most of my work has been in the southeast. I have done some work in Pennsylvania. Most of it has been in the southeast of the United States and focusing here in South Carolina, because that’s where my operator licenses are. I have delivered wastewater training in Georgia, on site in Georgia, in classrooms settings in Georgia and North Carolina, but primarily in South Carolina. EP: Based on the consulting you have done and the people you have spoken with over these many years, what do you think are the most serious water challenges facing the United States and other countries right now? How have those magnified or changed during your career? DT: There are challenges with water supply, with water quality, and also issues pertaining to global warming. As far as the water quality goes, actually one out of three of the world population lacks basic sanitation for water needs, so that puts the water quality in perspective, I think. As far as water supply goes, as you know, our underground aquifers are supplies for many communities for their potable water or their drinking water supply. Of course they are affected by overuse and by pollution growth. They are affected negatively by it, so I think that’s a major concern. Also global warming is affecting the rising of oceans and the submerging of coastal cities. I think those are in my view probably the three most serious challenges facing the countries around the world as far as water goes. EP: They are certainly monumental challenges. Only yesterday, the UK environment agency tweeted that there are more than 5 million people in England and Wales living in or working in structures at risk of flooding, and they are having major floods there right now. Do you think we will see flood damage skyrocket around the world as sea levels rise? DT: I don’t really know whether worldwide we’re going to have skyrocketing of flood damage, but I certainly think that this trend will continue. I do think this is valid, and this is ongoing and probably will be around for quite some time. EP: You mentioned global warming. We’re seeing extended droughts and wildfires in many regions of the world and here in the states. And of course, we just have seen a new low established for the extent of Arctic sea ice. Do you believe we’ve reached the tipping point or soon will in terms of global climate change? DT: I think there’s evidence on either side of this issue. I think some people may think that we may have evidence that we’re approaching that, and I think others may think we may not be approaching that. No one knows if there is definitely a point at which a climate system shifts abruptly. I think there are forces on either side of that. EP: Dan, do you think Americans by and large are taking the threats seriously enough, and for that matter are people in other countries? DT: I think it’s a matter of education. The more education we have, the more informed people will be and the more they’ll take initiative. I think there’s always room for getting the word out, so I think we probably have some room for progress there. I don’t think that message is as strong as perhaps it could be. EP: Are you concerned about the widespread use of hydraulic fracturing to explore for natural gas in several regions of the country and with the resulting disposal of wastewater? DT: Yes. It’s not only in my blog, but I am also participating in an offering project with the Water Environment Federation where we are actually updating MOP [Manual of Practice] 29, which deals with wastewater, and I’m the primary author of chapter number two, which is a general chapter about effects that the wastewater has on treatment. One of the things we were asked to have some comment on was this hydraulic fracturing, and it was amazing to me how much of an impact it actually does have on our water supply. The EPA did some work in 2010. One of things that they learned was that in 2010, 70 billion gallons of water was used for hydraulic fracturing. When you looked to see how much water that is in relation to what is needed in various cities, if you take a city of 50,000 people -- 70 billion gallons of water would be the amount needed by 40 cities with that population. The water supply is definitely affected by hydraulic fracturing. EP: That’s important, I agree. DT: The chemicals that are used in the fracturing, in the water -- a lot of that water actually stays underground when they do the drilling, they don’t capture all the water. There is some groundwater contamination affecting the aquifers, and of course the aquifers are the source of a drinking water supply. The fracturing affects potential groundwater contamination. Then thirdly, health concern effects. There are actually 353 chemicals in the aggregate, in total, used in hydraulic fracturing. These 353 chemicals can cause human health effects. They can affect the skin, they can affect the respiratory system, they can affect the liver, and they also can affect the nervous systems of humans. In addition to all of that, municipalities really are not equipped to treat the dissolved solids that are in this water. Our work we did for the authoring project revealed that, and this was by one of the environmental groups, concentrations of total dissolved solids from fracturing can be as high as 200,000 milligrams per liter. Municipalities are not equipped to remove these dissolved solids, and so we have a wastewater treatment issue. Now I have seen some technology progress to treat this stuff, but I don’t think it is cost effective yet. For at least all of these issues, it is quite a concern, and I think that is probably why the EPA is cautious. EP: Too cautious? They don’t seem like they are moving very fast, but I understand regulatory action doesn’t ever move very fast. They don’t seem to be moving very fast to investigate the issues or enact standards governing wastewater disposal by the oil and gas industry. DT: I agree that the EPA is moving very slowly. I think part of that is because the agency is a reactionary agency. It’s not necessarily a proactive one, it is a reactive one. They are reacting to the conditions that are present. I think that they are also somewhat muted by other issues. There might be some people in the government that are leaning one way or leaning another way. There may be some lobbying from industry that’s kind of slowing things down. I mean I am not advocating this and or agreeing with it, but I think that the fact that they’re reactionary and there might be some other forces at work there could be part of this slowing process. EP: You mentioned the authoring process and something I am not familiar with, MOP 29. What is that, please? DT: The Water Environment Federation has several technical manuals, and the MOP is just an acronym for Manual Of Practice. MOP 29 is just simply the document pertaining to the biological nutrient removal process carried out by municipalities. They had an earlier version that they wanted to update, so they were looking for potential authors last fall, and I made myself available and I was selected. I am the primary author of chapter two of this publication. Right now it is scheduled to be published next February, so we are in various phases of the document. There are 17 chapters and 14 primary authors, and probably another 20 or 25 co-authors. We’ve got a group of almost 50 people that are working on it, 50 to 100 actually that are working on it in its totality. I just happened to have worked on a section that looked into this fracturing, how it affects wastewater. EP: Sounds like it’s an important document for industry to pay attention to. I take it it’s not updated very frequently. DT: No. The current one is multiple years old. We decided this time to write it for the operators -- not to write it for the engineers. This is a document that operators of the biological nutrient removal municipal wastewater treatment plants should be able to use as a resource. Although they can use it, we are not writing it for people intended to design a facility. We are actually writing it for the operators of the facilities. We’re not going to have a good bit of glossary information. We’re going to have a good bit of troubleshooting guides. I think there are over 10 case studies that are going to be incorporated in this, and we’ve got some really, really quality people that are working on it. I am really excited about it. It’s not something I actually have advertised a lot just because it’s still in the development stage. EP: Very interesting. I am glad you brought that up. You’ve focused pretty intently on water that is wasted, whether it is by industry or municipalities or individuals, for example. What’s the scope of that problem, water waste? DT: Well, I probably would prefer to focus on industry manufacturing facilities. I think a lot of it is just the profit and loss element. A company manufactures a product which requires a certain amount of water, and it might be less than a hundred thousand gallons a day. Then they make their product and treat their wastewater. They look for the most expedient way to dispose of it, and it just happens to be discharging it as a pre-treated wastewater into a sewer authority. To reuse water requires capital that they would rather not spend if it’s cheaper for them just to dispose of it. I think that’s why we don’t reuse that much. Certainly if there’s an incentive to conserve, then they’ll be interested in doing that. It might be more cost effective to figure out a way to reuse it than it would be not to. If that’s the case, then they will probably be forced to do it in the most cost-efficient way. To really purify the water is very cost intensive. To capture rainwater and to purify it and reuse it is probably also going to be very cost intensive. One of the things that could be considered is multiple industries banding together and discharging their water in larger volumes, and then purify it and send it back for the participating industries to reuse it. I think that’s a potential opportunity for a lot of companies. For example, you could have an industrial park. There might be five or 10 industrial manufacturing facilities at this park. They all may be buying and discharging 50,000 gallons of water a day or less. It becomes cost prohibitive to try and purify that water because each company would be on an individual company basis -- they would be having the start-up cost and the initial capital cost to purify the water. If all of them band together and it took their waste from their facility, now you’re at, say there are 10 companies at 50,000 gallons a day -- now you are looking at 500,000. Now the economies of scale should be kicking in, and all 10 of these companies could be banding together in a project to develop a water purification system and then return that water for reuse back at all of those industries. I think if we start looking at that, we’ve got an opportunity to get more companies involved, because then you can potentially have less capital expenditure for each company. It becomes cost effective and then everyone can benefit. EP: Are you seeing that done now? DT: No, that’s just something I would like to try to get implemented as a result of this water conservation effort. Primarily I’ve been working on helping individual industries satisfy their discharge permits, but in the process of doing that I now recognize this potential was there and forums like yours and the Water Environment Federation and other organizations might give me an opportunity to actually spearhead that nationwide. EP: That’s an excellent idea. Has anybody else been carrying that banner? DT: No. I’m the kind of guy that actually looks for something that someone else is not doing and takes advantage of it. One of the things that I am proud of is my life’s sustainability – my sustainability of retaining customers. I retain these customers not because I am cheap, but because I’m offering something that no one else is offering to them. I try to take advantage of something that someone else is not doing. I do it all the time, and I’ll invest money, I’ll invest time, I’ll invest energy and effort. I’ll make sure that I do what someone else has not been able to do. That is why I’ve stayed with customers for multiple years, in most cases. EP: You mentioned sustainability. You see it everywhere: Companies are claiming to be sustainable to the nth degree. Do you think most of those claims are bogus? DT: When it comes to sustainability of water, reusing water and purifying water, I think there is a lot of room for progress and improvement. Certainly some companies are doing more than others. For example, a lot times the incentive is the requirements of your product. So if you have to have, say, a food-grade product -- whether you are in the pharmaceutical industry or whether you are in the food industry -- you have a built-in incentive to try to purify water, because if you purify the water it is probably going to be allowed for reuse within your facility and then you just become a good citizen and you become a good environmental steward, and you can go a long way with it. 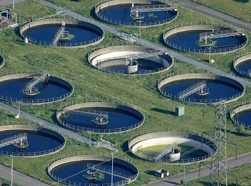 For example, there is an organization called The Water Reuse Association. They have an annual award ceremony, and I think some food industries actually are recent recipients of that award. That’s the kind of thing that I think can kind of take hold in other communities and other industries, in other organizations. EP: I would be happy to talk about other water issues if you have some in mind. DT: I have a customer in the food industry, and they are located in South Carolina. I have been their wastewater operator of record since 1998. I have actually improved the quality of their wastewater treatment from 1998 up until 2002, and in 2002 we had gotten to the point where we were given a lot of latitude. When I started in 1998, they were under special restrictions, and the city was coming in and monitoring them on an unannounced basis three days in a row each month. DT: That was from some earlier issues before I was working with them, but by 2002 we had gotten to where we could function strictly on self-monitoring, and they just come in now basically as a cursory inspection once a year. We do our own one single day per month self-monitoring. What had happened was, I had inherited this organization that had a discharge permit where they were limited 650,000 gallons of water discharge a day. In 2005, I believe it was, they were discharging for every full production day, they were discharging about 740,000 gallons a day. There was never any issue brought to my attention about water usage. I received a phone call in April of that year, and I was told that we were exceeding our discharge permit way too much and we had one of two choices. We either had to buy additional allocation from 650,000 to some number that would allow us to stay under, or we were going to have to discharge less water. I mean that was just a point-blank requirement that was placed upon them. So I went to my customer and talked to the owners, and they certainly didn’t want to buy the additional allocation which I proposed to them -- 125,000 gallons, so we would go from 650 to 775 so we would have a little cushion. I said 100,000 so that would put them up to 750, and it is costing them $125,000, and they were not interested in that. They wanted to conserve on water. DT: My mission was to go to the regulator and get some time for them to implement the water conservation, and they allowed me that. What we ended up doing was starting several things -- and by the way, today our average is under 600,000 gallons a day. We were over 740,000 in 2005, so we brought that number down. On a monthly basis, we went from 21 million gallons down to 14 million gallons, and we reported a 20 percent decrease. We did that basically by several things. Number one, we found out that we could actually recirculate some water that we were pumping through our vacuum pumps. We had 12 of those and were just using city water and cooling them down at 8,000 gallons a day and just dumping that down through the sewer system. Ultimately, we were able to take all of those to decrease 100,000 gallons a day, recirculate that water I think it was back to the cooling towers, to cool the water and then use it for a supply to cool. That’s where we saved 100,000 gallons of water. We didn’t even do any purification. We just did some water recirculation. We also implemented some procedures that was approved by the USDA. We were dumping in cook tanks 30,000 gallons each full production day. We got that approved so we could do that once a week, so we saved 30,000 gallons a day on that. Then we implemented some procedures in the sanitation department. One of things we did was do a lot of squeegee instead of wet water spraying and another thing we did was implement some nozzle restrictions on all of our hoses. Composite of all of that has actually been able to bring us down from 740,000 gallons a day to consistently under 600,000 gallons a day just through those measures. Then, of course, we supplement that with monthly water meetings and through communications. We also have a direct-wired remote device in the plant, and so we have daytime controls and nighttime controls that help us keep our instantaneous flow rate within an acceptable number during production time. Then we have a 24-hour accumulator that keeps the accumulated flow, which is what we view at night. The composite of all of that is just simple steps to implement a good bit of water conservation without going through capital expenditure or purifying and reusing a lot of other water. EP: Did you publish it as a case study anywhere? DT: I have not. Maybe it’s something that I should, but no, I have not. EP: It would be a pretty good object lesson for some other companies that might utilize some of the things you tried out and succeeded with.